Top: Zoning map with height districts, New York City Building Zone Resolutions, 1929. New York Title and Mortgage Company. Collection of The Skyscraper Museum. Bottom left: "Setback Principle," New York City Building Zone Resolutions, 1929. New York Title and Mortgage Company. Collection of The Skyscraper Museum. Bottom right: 347-351 West 36th Street. NYC Department of Records, Municipal Archives. In 1916, New York City passed America's first comprehensive zoning code. The new regulations established use districts that limited manufacturing to specific areas, and mandated setbacks on tall buildings, that would assure some sunlight reached the sidewalks and streets. No area of the city would be more intensely affected by the two major requirements of the code than the Tenderloin as it was transformed into the Garment District. On sites located more than 100 feet west of Seventh Avenue the code initially permitted unrestricted industrial use. Buildings facing onto Seventh Avenue and Broadway were in a business district where industrial production was limited to 25% of the total floor area. Thus, the tall buildings on Seventh Avenue and Broadway primarily housed offices and showrooms, while factories predominated on the side streets and on, and west of, Eighth Avenue. 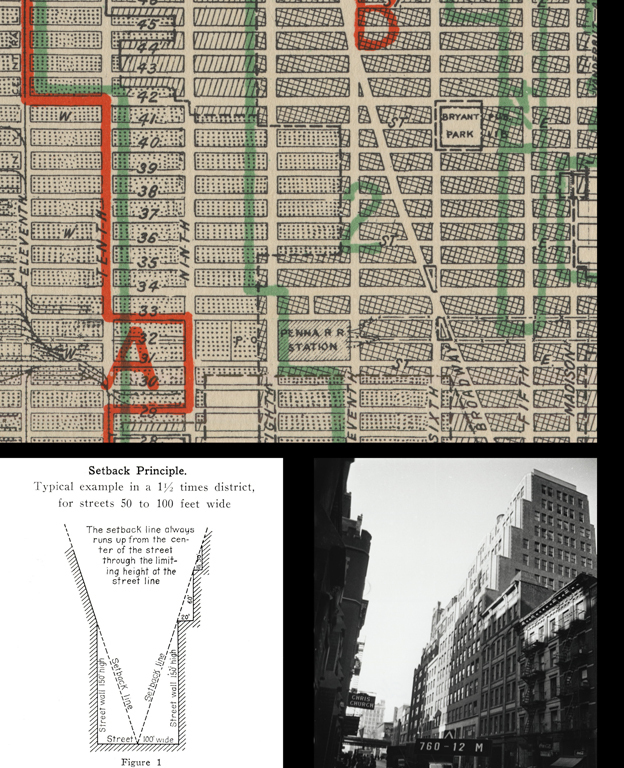 The code's mandate for setback massing shaped the distinctive streetscapes of the evolving Garment District. Zoning divided the city into five different "height" zones with variants of the setback formula that specified a maximum height above the sidewalk before the first setback and a ratio for the recession for the vertical rise. East of Eighth Avenue, the Garment District is in a "two-times" zone-meaning the setbacks started after two times the width of the street. Eighth Avenue and the blocks to the west were in a 1�-times zone (in 1928, Eighth Avenue was added to the two-times zone). The zoning permitted a tower of unlimited height on 25% of a building's lot area, thus explaining the tall towers on several Seventh Avenue and Broadway buildings. NEXT: WHO BUILT THE GARMENT DISTRICT?